I found this at the grocery store this week. This is what the inside of it looked like. And for those of you that have asked me to set something next to it for a size comparison, here is the item set on a piece of paper. Don’t know if I’ll spell this right but here goes! A Isrealie melon? Spell check doesn’t even help with this! A Santa Claus melon! We had one last week. Oooh, is it sweet? It doesn’t look as though it would be, but that’s what I’m reading. I wish the grocery stores here weren’t so limited. 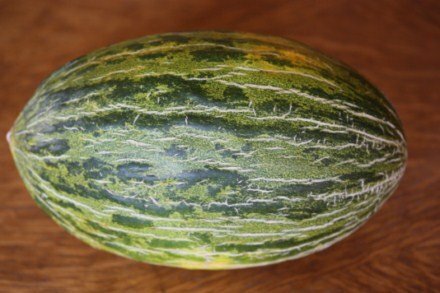 Santa Claus melon. They are super sweet and delicious. Only available here in the Texas Panhandle for a very limited time!!! It’s a melon. 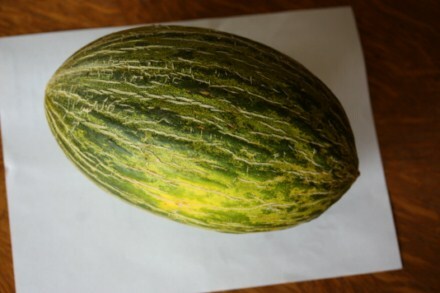 I come from the Philippi es and we call this “Melon Tagalog.” It only grows during summer. My father would shred the melon meat and then we will add fresh milk, sugar and ice. It looks like a cross between a honeydew and a watermelon! Very interesting! I thought I saw this at the grocery store yesterday… but, I’m not sure what the name is. The sign said – tastes like a cucumber and melon. 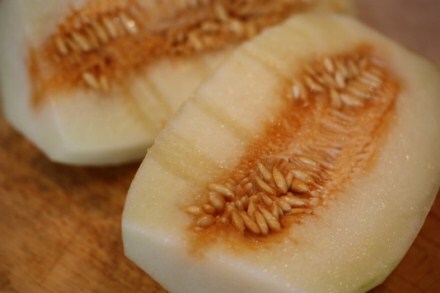 My uncle is Chinese and introduced this melon to me over 30 years ago. Nobody my parents knew had seen one of these before that. I don’t know what it’s called, but it’s delicious and sweet when ripe. Id have to agree with christmas/santa clause melon. Very delish!